Born in Limbe (Cameroun) - January 1986,by 24 years living in Italy,Giovanni have a deep knowledge of music,involved in House Clubs during the last 13 years. Red Zone club was the 1st experience,a place where Giovanni understood many concept of music and music's guide lines. Every few years a name creates a flame of interest in the Arts. Some see that as a changing of the guard. A new trend, a talent that points to the future. The wave of excitement feels like an overnight sensation. But it rarely is. Today the name is Giovanni Ikome. The Young Don, of the House remix and post production. 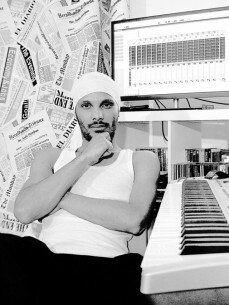 Like his explosive tracks, with earth shattering drums, razor sharp synth programming and to die for basslines. Gio has been developing his skills for the for the past 12 years, and quickly became the go to man for music at the cutting edge. Racking up DJ credits alongside some of house music"s best Kerry Chandler, Osunlade Terry Hunter Joe Claussell Blaze - Jovonn Mr V & Karizma. This experience has gave Mr Ikome a vision of where he wanted to go. But intent on creating something classic and new. With each release getting stronger and worldwide heavyweight industry support from dj"s.